The Image Acquisition Tool enables you to explore, configure, and acquire data from your installed and supported image acquisition devices. You connect directly to your hardware and can preview and acquire image data. 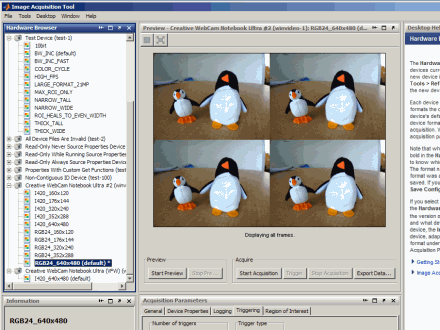 Using this app, you can log the acquired image data to MATLAB® in several formats, and also generate a VideoWriter file. The Image Acquisition Tool provides a desktop environment that integrates a preview and acquisition area with acquisition parameters so that you can change settings and see the changes dynamically applied to your image data. MATLAB Toolstrip: On the Apps tab, under Image Processing and Computer Vision, click the app icon. MATLAB command prompt: Enter imaqtool. imaqtool opens the Image Acquisition Tool, which enables you to explore, configure, and acquire data from image acquisition devices.